With all the media attention surrounding data retention over the past week, another big issue affecting all Australians – online copyright enforcement – has almost taken a back seat. However it’s still a burning issue, so here’s an update of what’s been happening. 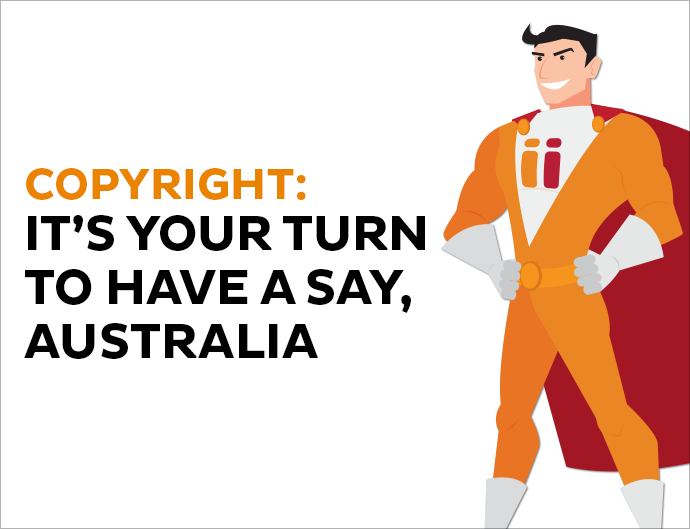 The federal government, through the Attorney-General’s website, has made its draft online copyright infringement discussion paper available to the public, not just to read, but as an invitation for you to comment on. Comments from everyone, not just those who work in the affected industries, are welcomed and will be considered as part of the ongoing discussion and input to policy formulation. 1) Using the Attorney-General Department’s public consultation form, located on their website. 2) Sending your comments directly to a dedicated email address, copyrightconsultation@ag.gov.au. There is no prescribed format, just put your thoughts down, check the spelling and send it off. Every comment counts, so if you have three words or three pages worth of stuff to say, it’s worthwhile. You may be cynical and think your opinion will change nothing, but the Internet changes everything. Significant world events have been shaped by the population using online approaches to influence outcomes. This may not be at the same level as President Obama’s election or the Arab summer but if it is important to you, I’d urge you to let the right people know what you think. Ultimately, we want an approach to this issue that works for everyone including our customers, iiNet and other ISPs, as well as the content holders. We’ve said our piece (many, many times! ), and now it’s your turn to have a say, Australia. What does it mean for me if I downloaded the Dallas Buyers Club movie? Basically the gist of it is that I believe without actual proper investigative process to identify the individual infringer (not the spurious IP, service or name on the account), these suggestions can’t possibly be enforced fairly. Make it accessibly, affordable and without unfair restriction, content owners… stop trying to shift the blame. I’ve been away, so just now was reading your July newsletter. I am rather surprised and disappointed that you use (at least three times) a count of Google hits to equate to the number of options (e.g. BitTorrent offerings)available. That’s very misleading, and detracts from your argument. What happens when someone bought a Blu ray/dvd copy of a film and uploads it online to share it? Is it prohibited? If not, what happens to those who download it? I honestly believe this is the idea of a sick mind (The Attorney General) I lived under a dictatorship and this is exactly the behaviour of those with too much power in hands. So if you’r not propered to do that, then don’t charge us %10-20 more then every other country in the world for digital good’s and that include’s game’s!! would like a receipt, receipt number when I pay on line, but you site doesn’t even ask if its wanted. Receipts are viewable in your personal Toolbox. Our Customer Feedback Surveys do indeed have a feedback/comments box at the end and all feedback goes directly to the customer service rep you spoke with and their manager. We love to hear our customer’s feedback, so please do let us know how we can improve!